There are many reasons why resistance training is so important for everyone but particularly women to do. One of which is it helps fight against a reduction in bone density which can lead to Osteoporosis and Osteopenia. Weight bearing and muscle strengthening exercises are important for building and maintaining bone density. Our bones regrow and rebuild themselves when there is an external stimulus, e.g. resistance training. Resistance training also helps increase your metabolism to enable you to burn more calories even whilst resting. This is an important aspect when trying to lose weight. A lot of people do not realise how much of an impact doing resistance training has on so many aspects of you health. Often women think that doing cardiovascular exercise is how they will lose weight but it is actually more effective for you to do resistance training, it not only will help you lose weight but it will change your body composition. Of course cardio is important particularly for a healthy heart but not to the extent that many people trying to lose weight think. People often plateau when they are doing just cardio and get disillusioned, make sure you incorporate resistance training into your fitness regime. 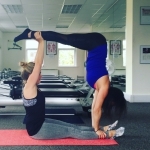 Pilates Plus Dublin Proformer classes incorporate exercises such as lunges and squats done with a twist of having to control the machine whilst doing them. You effectively work your core with a huge array of exercises including many plank variations and many abdominal exercises that use your whole core. It is a dynamic resistance based workout for your whole body – arms, back, shoulders, legs, bum and obviously abs are worked. Fans of he system include Rosanna Davison, Alessandra Ambrosio, Sofia Vergara, Calvin Harris, Michelle Obama, Jeremy Piven, Kim Kardashian, Khloe Kardashian and Martha Hunt.